What Happened When We Took the Glyco Flex® Plus Challenge? 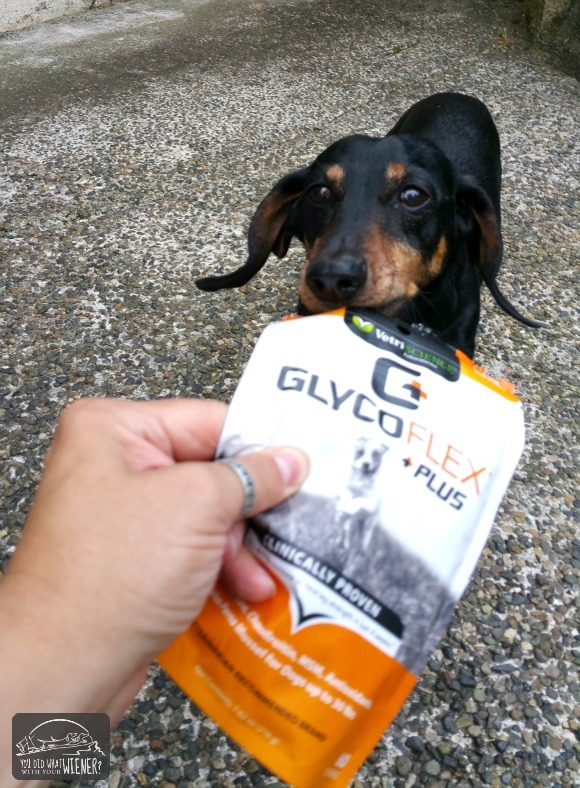 You are here: Home / Dog Health / What Happened When We Took the Glyco Flex® Plus Challenge? Some of you may be wondering what happened with the Glyco Flex® Plus Challenge. Back in mid-September, Chester started the 30-day challenge – take Glyco Flex Plus for 30 days and see what happens. Glyco Flex Plus was made for dogs that are showing signs of slowing down and having a harder time getting around (i.e. helps “crotchety” senior dogs)…. of which Chester is one. Sort of. He is still pretty spry for an old guy. We kept you updated on social media but then you didn’t hear anything after the initial 30-day period. Well, Chester has continued to take Glyco Flex Plus since September. He has been taking it for almost 3 months now. I’ll be honest, he isn’t acting like he is 5 again. Although I can hope, I know that’s an unrealistic expectation though. The best you can hope for with a joint supplement is a bit of improvement in mobility and stiffness. Your dog won’t become a puppy again. I DO think that Chester is moving around a bit easier these days. He’s not as quite as stiff when he gets up. He’s also got a little more giddy-up in his step on our walks. He’s not lagging behind and, in fact, is trying to out-run Gretel sometimes. I DO think Chester needs to be on a joint supplement to help hold off any additional degradation of his joints. The joint supplement of choice for us is going to be Glyco Flex. Glyco Flex is one of the best joint supplements I have found. The new Glyco Flex® Plus contains a whole lot of helpful stuff besides just glucosamine, chrondroitin, and MSM – the standards for joint supplements (and, by the way, it has higher levels of this stuff than most supplements). It also contains antioxidants such as omega 3 fatty acids, vitamin E, C, and grapeseed extract. The part I was most excited about is the high levels of DMG-containing perna (green-lipped muscle). You can read more about the company that makes Glyco Flex, FoodScience Corporation, and DMG here but, basically, DMG helps the body produce large amounts of antioxidants. The Glyco Flex Challenge has ended but you can buy Glyco Flex Plus (affiliate link) for less than $13 per month (for small breeds). If you have a senior dog, or any dog showing signs of slowing down and having a harder time getting around, I highly suggest that you try Glyco Flex Plus to see if it makes a difference. Disclosure: This post is sponsored by GlycoFlex and FoodScience Corporation. I received compensation in exchange for sharing information about GlycoFlex. However, I only write about products that we would use or can stand behind here at YouDidWhatWithYourweiner.com. Everything I say is really how I feel. FoodScience Corporation is not responsible for the content of this article. I will spend about 100.00 on my two for Christmas…they are my babies! Thanks for the update. I was wondering how you were doing. Rodrigo is on Canine System Saver, which helps joints and immunity and he’s doing great on it. The other three are on Nupro, which has a beef liver base (which Rodrigo can’t eat). I add green lipped mussel and turmeric to their meals a few days a week and they’re all doing great! I like reading about joint supplements, because I get questions about them all the time. Sometimes you can be using one that works great for a long time and then it doesn’t work at all so it’s nice to read about one that someone had some success with – I’ll spread the word. Yeah, I’ve heard they can stop working after a while so I like to change now and then. I think they all help with holding off the degredation to varying degrees though…. at least I hope. That’s awesome that the supplements seem to be helping him move better! Going to have to check this out for our Phod. I remember Glyco Flex being one of the joint supplements we used to recommend and sell at the vet clinic where I worked. You go Chester! He is so cute in his little camo jacket! Good to hear about your actual experience since I’ve noticed Tim is a little stiff after a day of doing more than the usual amount of running.